You ask, we answer. 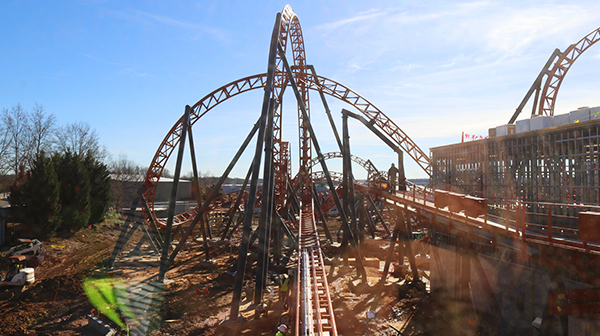 Here's the latest on Copperhead Strike. 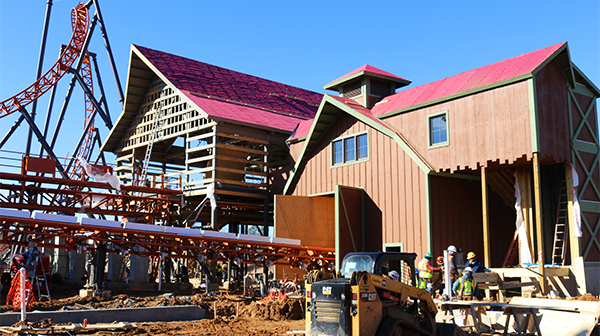 Construction crews are busy in the new year. 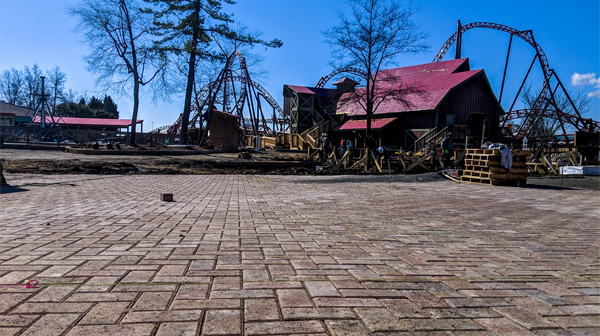 The asphalt midway around the Carolinas' first double launch coaster is completely torn up and the paths are being replaced by brick pavers. Game stands were removed, making way for something a bit more cozy in Blue Ridge Junction ... more on that in a later post. 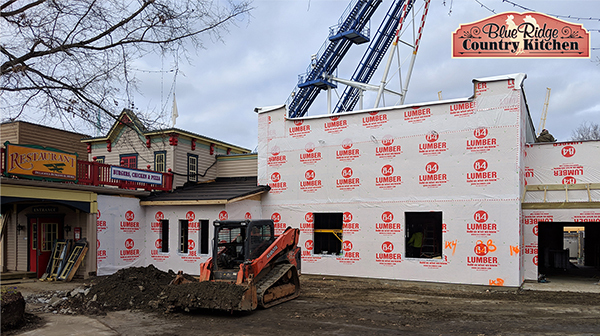 Blue Ridge Country Kitchen, formerly Wings restaurant, is being upgraded with even more indoor air-conditioned seating. 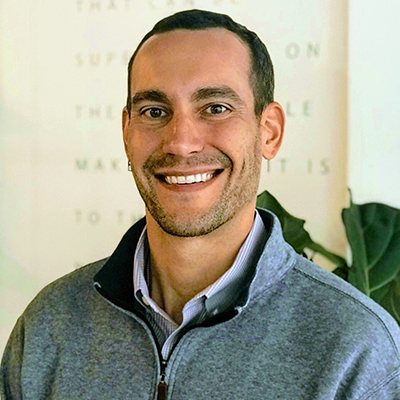 A new menu featuring delicious rotisserie chicken and other farm-fresh goodness inspired by the mountains of the Carolinas will please the palates of everyone in your family! The steel frame for the Mountain Gliders is in place. 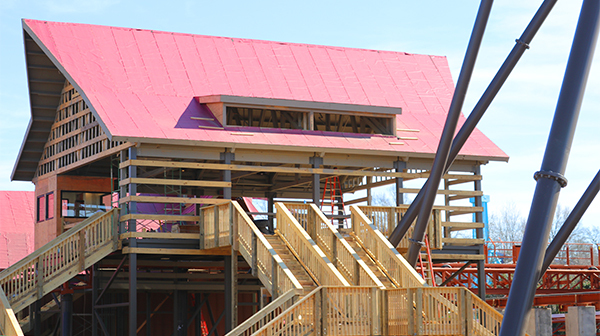 This fan-favorite attraction will be an excellent companion to Copperhead Strike in Blue Ridge Junction. The “Phantom Flyers” opened at Carowinds in 2005. The ride was built in 1935 for Coney Island Amusement Park, then moved to Kings Island in 1972. A Woodstock theme took over in 2010. Last season it was removed to make way for Camp Snoopy. 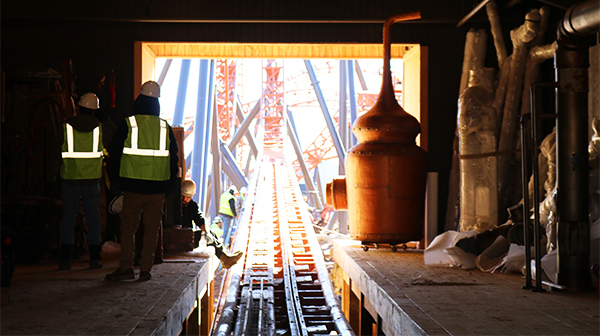 That's all very interesting, but you're here to see the progress on Copperhead Strike, right? Let's launch into some construction pictures. The framework and stairs for the station house are in place. You'll climb into your getaway car two-by-two into four, four-seat cars per train. 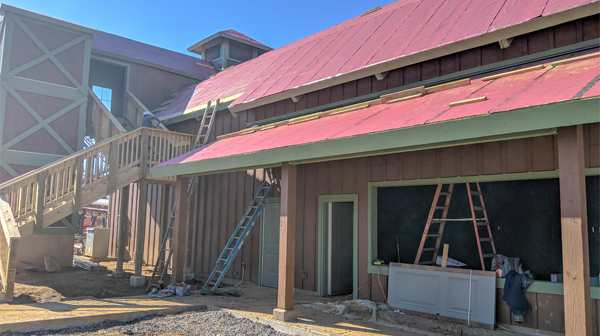 The launch barn is nearing completion and the Miami River Lumber Company would be proud. 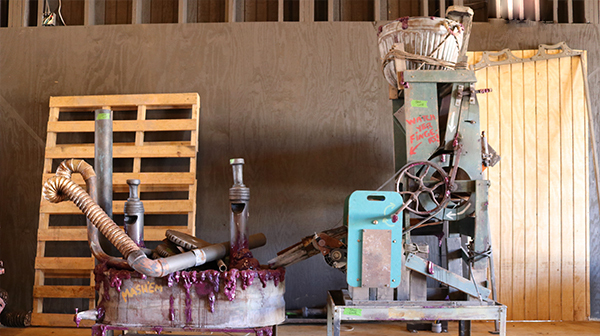 Inside the barn, you'll get a glimpse of Granny's jam-making operation. You may even learn a few things about her secret recipe. As you leave the ride you'll wander into an amazing vantage point to watch riders launched from 0-42 mph in 2.5 seconds and into the first vertical loop. You can also delight at the sight of Copperhead Strike's coiled track. The team constructed 230 support columns for Copperhead Strike's slithering layout, more than for Fury 325 (170) or Intimidator (180). Outside you can view your on-ride photo. If you’re wondering where that camera will be - we've got those details coming later! 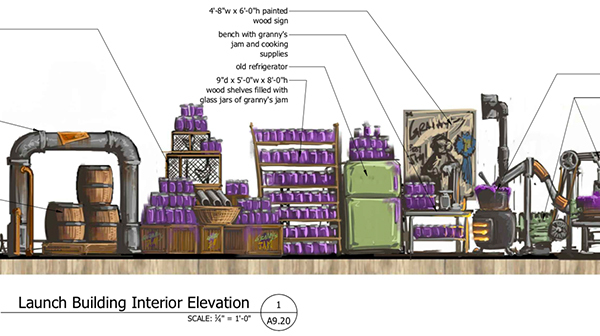 The theming company, Weber Group from Indiana, arrived mid-January with props for Granny Byrd's farm. The immersive experience begins before you enter the queue line and continues throughout the ride. Start your engines! The first delivery of getaway vehicles arrived here from Mack Rides in Germany on January 25. Copperhead Strike will feature three trains that can each hold 16 riders. 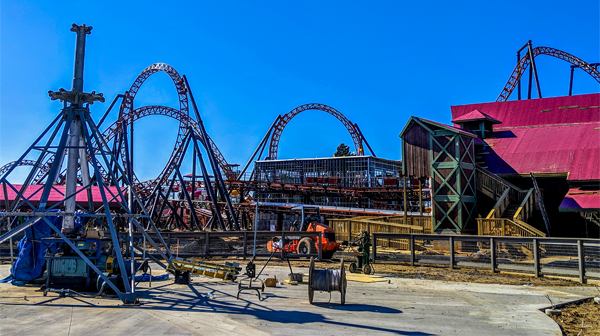 Ride testing is scheduled to begin in early February. The initial tests will be with water dummies weighing 170lbs each, the standard weight of an adult. The weight is then raised to 220lbs each to determine the effect on launch acceleration. From there, we calibrate the system to provide a perfect ride each time, regardless of the weight of the train. 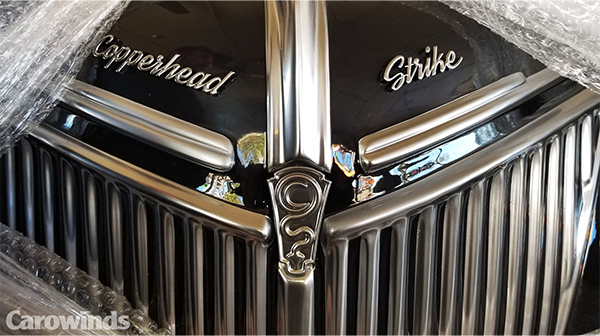 Copperhead Strike will open to the public in the spring of 2019. Enjoy Exclusive Ride Time with a Gold Season Pass!